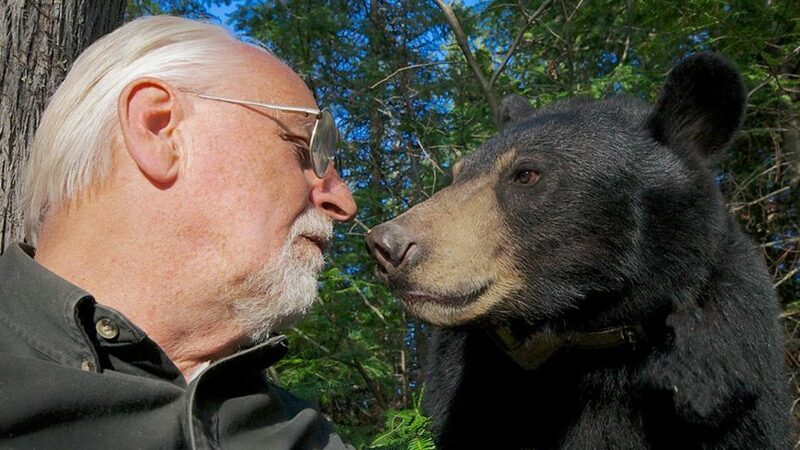 Dr. Lynn Rogers from Ely, Minnesota has spent most of his life studying black bears. Although much of his bear research has been conducted in Minnesota, he got his start in Michigan. Rogers is originally from Grand Rapids, Michigan. In 1967, Rogers got a job at the DNR’s Cusino Wildlife Research Station in Shingleton. The late El Harger was doing bear research out of Cusino at the time. A good crowd turned out to hear what the world-renowned black bear expert had to say about the animals at Fisher Hall on Michigan Technological University’s campus in Houghton on April 18, 2017. Rogers’ presentation was part of the DNR’s Wildlife Through Forestry forum series and was also sponsored by the US Forest Service and USDA. Rogers pioneered methods of bear research that involve gaining the trust of individual bears, so they would accept the presence of researchers as they went about their daily activities. By walking with bears to observe what they actually do, he has been able to learn far more about the animals’ behavior and biology than would be possible by simply monitoring the movements of animals fitted with radio collars. As a result of his groundbreaking research methods, Rogers has been featured in a number of documentaries and other television programs filmed by National Geographic and aired on the Animal Planet cable network. Rogers is currently the principal biologist at the Wildlife Research Institute in Ely where he founded the American Bear Center, which is a major tourist attraction. Bluff charges are events involving bears agitated by the presence of people that suddenly run toward the people, but stop short of making contact with them. Rogers said his first experience with being bluff charged by bears was when he was working in the UP out of Cusino and they were catching cubs. Blow slaps are less intense warnings that involve a bear advancing a step or two toward a person while blowing explosively and then slapping the ground hard with a front paw. Rogers said bears would sometimes slap a sapling or some other object as part of this display to make more noise and more of an impression. As far as duration of denning, the shortest and longest denning periods Rogers has recorded in northeastern Minnesota are 155 and 225 days (5.1 to 7.4 months), both of which involved the same bear. Rogers added that there was still about 24 inches of snow remaining on the ground when the female left the den with her cubs that year, but a solid crust had formed on the remaining snow. Another female bear didn’t leave its den until April 27 that year. Most bears use a new den every winter, according to Rogers, but he said one of his study bears reused the same den three out of four years. Lynn said the den that was reused multiple times is a “secluded rock den with the right size entrance for a mother bear to squeeze into.” He added that den is on an island and that even during the year the bear did not reuse the same den she denned in a different location on that island. That particular rock den is so appealing that Rogers said one of that female’s daughters that was born in that den, used it two years in a row. She gave birth to her first cubs in the den and then denned there again the following winter with her yearlings. Through the use of webcams placed in the dens of adult female black bears, Rogers has discovered that there is a lot more going on in bear dens during the winter than formally thought. Pregnant females give birth to cubs in dens during the winter. It was previously assumed that females either slept through or were groggy during the birth of their cubs. Rogers proved that is not the case. Video that the researcher has captured in dens containing pregnant females shows that they are very much awake during the birth of their cubs, grunting to the infants when they are born, licking them, keeping them warm and caring for them during the remainder of winter. Most cubs are born during January. The video confirms exactly when cubs are born as well as the fact that cubs are active in dens throughout the winter, too. Rogers said the average litter size for black bears in Minnesota is 2.6, but the number of cubs a female has is directly related to her nutritional level. He said that pregnant females that don’t weigh at least 148 pounds when they enter dens usually abort their cubs because they don’t have enough fat reserves to nurse cubs. During years with poor natural food supplies, for instance, the average number of cubs pregnant females give birth to may only be two. When pregnant females have access to plenty of food to gain as much weight as possible, they can have larger litters. Black bears have been known to have as many as five cubs in a litter. The website for the North American Bear Center is www.bear.org. During the winter, web cameras in bear dens can be accessed through that website. Rogers offers black bear field study courses. For more information about these courses go to www.bearstudy.org.